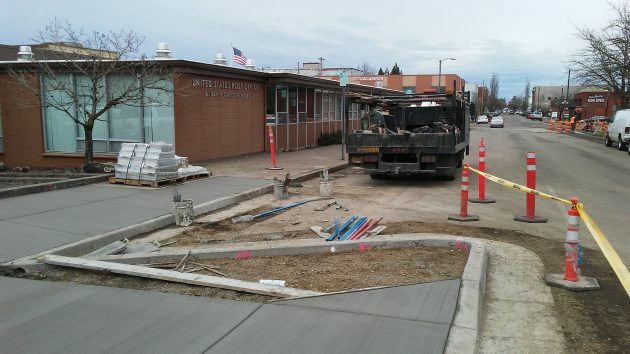 The curb has been poured, outlining the future parking pattern at the post office on Second Avenue. While we’re at the Albany Post Office, take a look at the novel — for Albany — parking pattern taking shape: Angled spaces on your left into which you will be expected to back up. The diagonal back-in parking on the left-hand side of two one-way streets — Calapooia and Second — was recommended by the advisory board of the Central Albany Revitalization Area (CARA) last year. The city council then went along with the design when it awarded a contract for pavement, sidewalk, utility and lighting work in the area around and near the post office. The construction has been going on for a few weeks. There will be 35 back-in diagonal spaces on the two streets. They will replace the 18 or so parallel spaces that exist on both streets now. In addition, there will be 12 back-in spaces on First Avenue on the north side of the post office block.. But they will be on the right-hand side of the street directly in front of the Albany Carousel. In the Albany Fred Meyer parking lot Wednesday afternoon. HH, is that your yellow Mustang? Tell me it is and you staged that shot. Just kidding. After all who would drive a yellow auto. Someone who is unable to color inside the lines! Say! Did you happen to ask any of the construction workers a few questions. First, have they ever worked on this parking design before. Secondly, what they thought of it. Call me curious! Could be fun to sit on the porch of the Monteith House soon!! Anyone who prefers to be seen quickly on the road instead of just invisible enough to add a few critical milliseconds delay to another driver’s reaction time. Also, anyone who wants to minimize heat gain on a hot summer day and heat loss on a cold winter night. 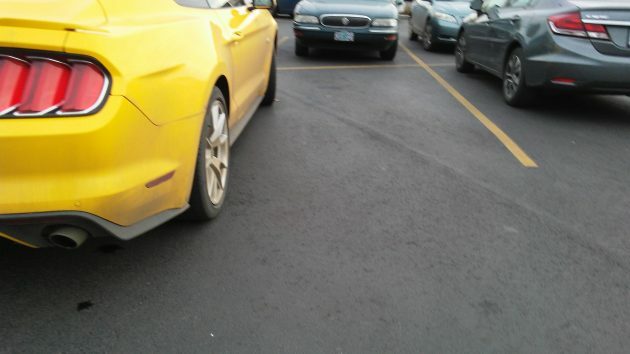 I would be surprised if the yellow mustang park job was not deliberate. This is the same kind of driver who believes that any space, regardless of how small, is plenty to merge into.